Originally, In The Mood For Thai was not the restaurant my boyfriend and I were going to dine at. However, walking past this place, we were intrigued by the contemporary setting, and decided to eat here instead; a decision that we definitely did not regret. We were greeted instantly, and as we were the only customers, we were able to choose where we wanted to sit and was handed the menu from there. The menu in the restaurant did look notably barer than the take away menu flyers outside, but nevertheless, we had a few dishes that we were eager to try. Our drinks were hot green tea and coconut juice. 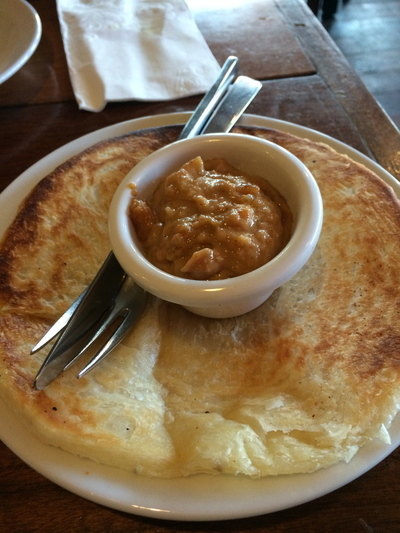 We ordered a side entrée of Rotti served with peanut sauce ($4). We were initially disappointed that it only came with one rotti slice, though it was fresh, hot and soft. Peanut sauce by nature is pretty heavy, and though it was on point and tasty, it did get a bit overwhelming. However, luckily, the rotti bread was delicious enough to eat on its own which we did. 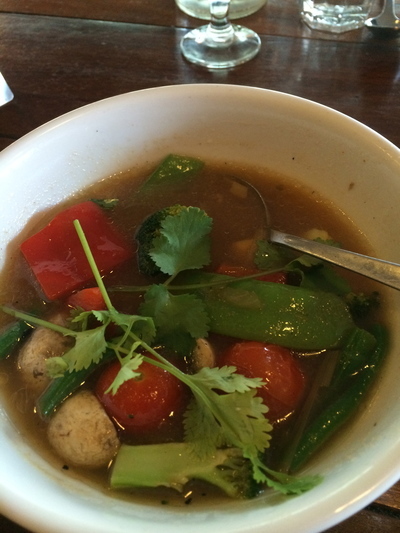 The Tom Yum soup with vegetables ($7.90) exuded this spicy aroma that was very alluring and pungent. It contained mushrooms, young galangal, lemongrass and kaffir lime leaves. The lemongrass had such a strong fragrance that just held the soup together. The vegetables were great, and added some substance to the soup. It was a bit spicy, so if you’re not a fan of chilli, an alternative to the Tom Yum soup is the Tom Kha soup ($7.90), which is a mild soup. 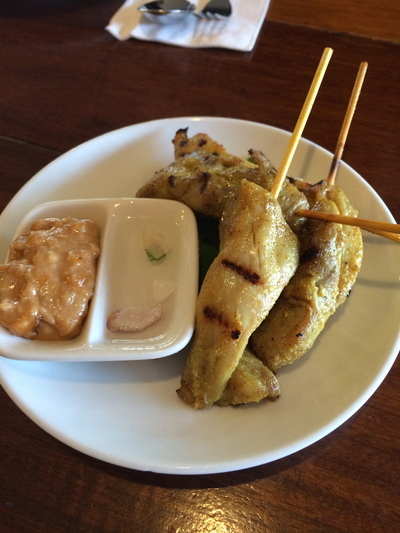 My boyfriend ordered the Grilled Satay Chicken ($6.90) that was accompanied with peanut and lime sauce. It was well cooked, moist and wasn’t too heavy. The light char from the grill added a really great texture to the chicken. The choice of two condiments added two different flavours to the chicken, with the lime sauce being more tangy and light compared to the peanut sauce. We also decided to make our own noodles. 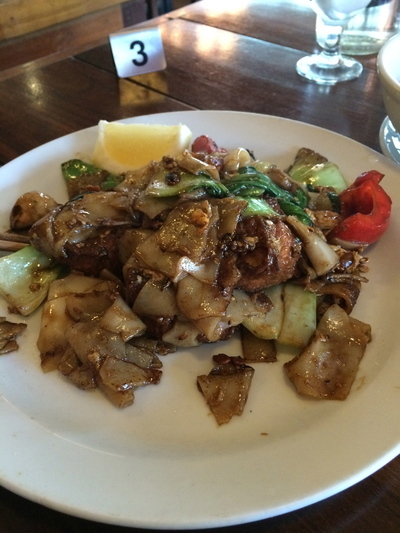 Choosing something different to what we usually have, we chose Pad See Eiw with vegetables and tofu ($13.90). Pad See Eiw noodles are the flat stir fried noodles served with sweet soya sauce and egg. The sauce slightly overwhelmed the dish, but if you looked past that, the noodles were well cooked and delicious. The tofu was cut in huge chunks that would have been better if they were cut smaller, but that’s only a small criticism. Overall, the dish was delicious, and was served with a variety of vegetables. A much-needed lighter meal in between these heavy dishes was the tofu salad ($15.90). Also gluten free, this dish was so light and refreshing, and definitely our favourite of the whole meal. It contained lightly fried soy beancurd with fresh mints, red onion and cherry tomatoes. The presentation was immaculate, and the serving portion was huge; had we just ordered the salad with a small entrée, it would have been enough to fill us up. The lemon and mint added a beautiful tangy flavour that we couldn’t get enough of, while the bean curd tofu was slightly chewy and tasty. The salad, made up of lettuce, onion, cucumber and long strips of carrot was so fresh; a definite stand out meal. While I had never heard of, or had been to In The Mood for Thai, my boyfriend and I did not regret choosing to dine here for lunch. It hit all the crucial points for me; the service was fast, efficient and the staff were very friendly and helpful. The food had large portions, was fresh, and was brought out very quickly. It was also not too expensive for the portion sizes we received, and the modern ambience was clean and quirky, and was what initially drew us to this restaurant. Overall, a very joyous and great dining experience that I would like to enjoy again in the near future. Where: Shop 3/52-60 George Street Parramatta NSW. 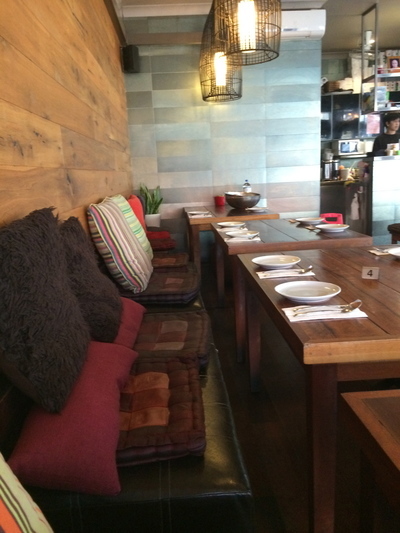 Good for kids: Yes, if they enjoy Thai food.